Facing a mass casualty incident remains an unlikely occurrence for many healthcare providers. But in areas throughout the country that regularly experience high rates of violent incidents, coming face-to-face with gunshot victims over the course of a shift can be a common occurrence for emergency medicine clinicians. Such cases often present the first and only chance for healthcare professionals to have conversations with patients about gun safety. The hope is that such interventions can help reduce a patient's likelihood of getting injured again, killed or becoming a perpetrator of violence themselves. A growing number of experts are calling on physicians to take a more active role in talking about gun safety with their patients. Research has shown such discussions can help prevent firearm injury and deaths. Such efforts have in some ways put trauma clinicians in the position of being de facto social workers and psychologists for many of the patients they treat for gun violence. "It's kind of weird trying to understand what many of my patients are feeling in terms of their vulnerability," said Dr. Michelle Gittler, medical director of Sinai Health System's Schwab Rehabilitation Hospital in Chicago. Gittler oversees physical rehabilitation for many of the system's patients who suffer debilitating injuries as a result of getting shot. Sinai is one of only four hospitals within Chicago's metro area with an adult Level 1 trauma center, and so it takes in trauma cases from all over the city. Gittler said trying to talk to her patients about firearm safety can be difficult when many come from violent communities where owning a gun is often seen as the only line of defense from becoming a victim. "I've got nothing to offer them," Gittler said. "I'll tell them they shouldn't have a gun, and they'll look at me and say, 'You're crazy, do you know where I live?' "
The most recent and worst mass shootings in modern U.S. history in Las Vegas and Sutherland Springs, Texas, mark 2017 as a deadly year for gun violence. From Jan. 1 through Nov. 9, a total of 378 incidents where four or more victims were shot have occurred, according to the Mass Shooting Tracker website, resulting in 531 deaths and more than 1,600 people wounded. Gittler and others say a de facto ban on government-funded research on firearm injury that Congress put into effect in 1996 has left a dearth of evidence on how best to identify risk factors in patients, or the most effective strategies providers could employ when counseling patients about gun violence. The lack of research means many of the country's largest professional physician organizations have little in the way of meaningful guidelines or best practices that could aid clinicians in their talks with patients about gun injuries and how to minimize their risk. "For most areas in which physicians counsel patients about safety or about behavioral risk factors, we have decades of research to back up who we screen, how we screen them and what to say," said Dr. Megan Ranney, professor of emergency medicine at Brown University's Warren Alpert Medical School. "For firearms safety discussions, we have very little evidence—so the evidence that we do have is taken from a smaller body of evidence than is typical." A lack of a standardized approach has left many physicians to develop their own individualized ways of counseling patients. "My approach has always been to be a better listener than a talker," said Dr. Mark Shapiro, trauma medical director for Grady Health System in Atlanta. "Having the patient, the family, relatives and friends find the topics that they need to address is much better than me telling them what I think." Shapiro said he tries to pick up on certain social cues such as a lack of eye contact when talking to patients. He said such signs can provide him with an indication that the patient might have a high exposure to violence, and when it might be necessary to refer them to behavioral health professionals. "I can't necessarily see life through their eyes," Shapiro said. "I can listen and try to help and get them the right help—but it is our responsibility to at least guide them and bring it (violence) up." Sometimes a question as simple as 'do you feel safe?' can be enough to start a conversation with patients about gun injury and violence, said Dr. Dave Spear, an emergency physician at Texas Health Harris Methodist Hospital in Fort Worth. "It sounds like almost a joke of a question to ask," Spear said. "Twenty years ago, nobody asked that question, but now we ask every single patient." Spear said the effort to engage more with patients about violence and injury from guns has been mostly nurse-driven at the hospital for the past three to four years. It was at that time when triage questions were changed in an effort to screen more for potential signs of violence. Spear said he looks for at least one subject with every patient that he can delve into that will allow them to open up to him in order to have the tougher talk about guns and violence. At Harbor-UCLA Medical Center in Los Angeles, an injury prevention coordinator will work with patients whose injuries require them to be admitted to the hospital and connect them with a community group involved in violence prevention to counsel them during their stay. "Every patient is different, but it seems as though the relation to their family and the impact of them being injured or killed would have on them tends to make them think twice about the situation they have been in," said Dr. Brant Putnam, chief of the trauma and acute-care surgery division at Harbor-UCLA. But Putnam acknowledged much of his approach has been based on experience with patients. He said having a formalized set of practices to help clinicians engage such patients was something he felt was worth developing. 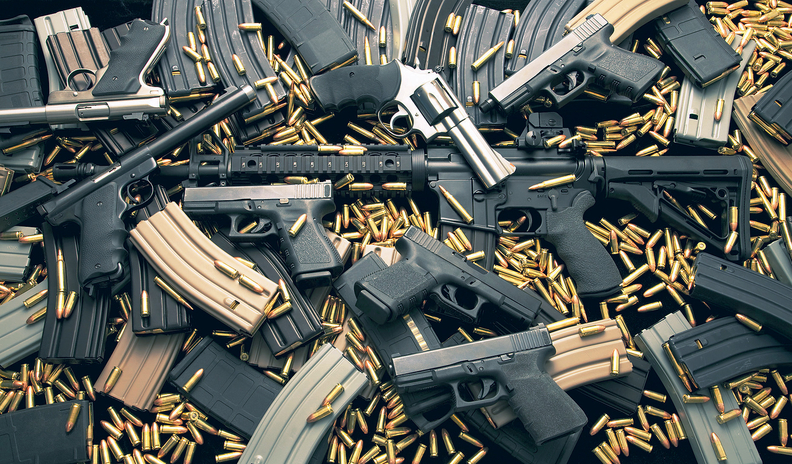 A number of professional medical societies have in recent years begun to outline a number of research topics to improve their understanding of the public health aspects of gun-related violence. In 2013, the Institute of Medicine released a set of its research priorities that included examining areas such as the characteristics of gun violence, risk and protective factors, prevention and other interventions, gun safety technology, and the influence of video games and other media. In February, the American College of Emergency Physicians published a list of research questions that researchers could consider to develop an evidence-based research agenda. Much like other public health concerns such a smoking or motor vehicle crashes, Brown's Ranney was optimistic enough public calls for action against gun violence would eventually lead to evidence-based solutions and past the political debate over gun rights. "Nobody is saying that we can't drive because there are car crashes—that is not the answer," Ranney said. "The answer is figuring out smart and acceptable and effective ways to reduce injury and death."